All of the UMA community congratulates our graduates as they achieve this milestone. To ensure a memorable event for our graduates, their family and friends, to know where you need to be and when, and to answer some typical questions, graduates and their guests are strongly encouraged to read through this information. Students who wish to apply for candidacy for graduation must file a graduation card, or use the online Candidacy for Graduation Form, by December 1 for December completions and April 1 for May and August graduation. Students should meet with their faculty advisors first to avoid any unfortunate surprises in the spring; however, students are ultimately responsible for being aware of program requirements which are published in the UMA catalog. Information is also available through the Advising Center, College Offices, Academic Advisor, or University Center. Commencement is scheduled for Saturday, May 11, 2019. All degree candidates must report to the Fort Western Room in the North Wing of the Augusta Civic Center by 8:45 a.m. At that time, line up for the Exercises will begin and last-minute “marching orders” will be given. Commencement Exercises will begin promptly at 10:00 a.m.; the length of Commencement is generally 2 hours. It is suggested that you make arrangements ahead-of-time to meet your guests after the ceremony in a pre-arranged location. Please be aware that traffic delays can occur the closer you get to the Augusta Civic Center. Graduates and guests may want to leave earlier to arrive on time for line up and seating. Childcare is not provided. If you have small children attending commencement, please provide for care for them during the ceremony. Graduating students needing accommodations for disabilities should contact Ariel Cassista, for more information at 621-3350/1-877-862-1234, ext. 3350, or e-mail ariel.cassista@maine.edu, no later than April 30. 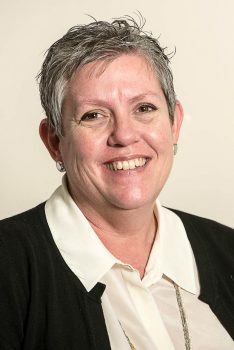 Judith Meyer is executive editor of the Sun Journal, Kennebec Journal, the Morning Sentinel and seven weekly newspapers owned by the Sun Media Group. She serves as vice president of the Maine Freedom of Information Coalition and is a member of the Right to Know Advisory Committee to the Legislature. A journalist since 1990 and former editorial page editor for the Sun Journal, she was named Maine’s Journalist of the Year in 2003. She serves on the New England Newspaper & Press Association Board of Directors and was the 2018 recipient of the Judith Vance Weld Brown Spirit of Journalism Award in New England. A fellow of the National Press Foundation and the Knight Center for Specialized Journalism, she attended George Washington University, lives in Auburn with her husband, Phil, and is an active member of the Bicycle Coalition of Maine. The Kathleen Dexter Distinguished Student Award is given annually to one of UMA’s top all-around graduating students. The criteria for selection include: 1) Scholarship; 2) Participation and leadership in extracurricular activities; and 3) Service to the wider community. Please visit the Graduation link on the UMA Bookstore website to order your cap and gown. Be sure to select the location where you would like to have your cap and gown delivered. Graduates’ caps and gowns will be black with a blue and white tassel. Questions should be directed to the UMA Bookstore at 621-3467 or 1-800-621-0083. Graduates must have the black cap, gown, and tassel to participate in the Commencement Exercises. Students who have achieved a minimum grade point average of 3.25 or higher at the end of Fall 2018 will be honored by wearing a gold braided cord around the necks of their gowns. Cords will be distributed during line-up. Those students who have completed the requirements for the Honors Program may be additionally recognized by medallions (please contact the director of the Honors Program for medallions). If you completed your degree requirements as of December 2018, your degree has been mailed to you. Students who complete their requirements as of May 2019 will have their diploma mailed to their home by the end of July. Students completing their requirements this summer will be mailed their diploma once the grade is on their transcript. Because of the large number of folks attending Commencement, it is suggested that you make arrangements to meet your guests after the ceremony in a pre-arranged location. Cell phones and pagers should be turned off. When this is not feasible due to urgent circumstances, the device should be set to vibrate or soft tone. Graduates should refrain from texting. All graduates and their guests are asked to remain for the entire ceremony out of respect for all of the graduates. Please see Commencement Protocol (under What Guests Need to Know). Commencement Reception: There will be a reception with light refreshments immediately following the ceremony on the UMA Augusta Campus Green (between the Randall Student Center and Jewett Hall). Please join faculty, staff, guests, and your fellow graduates in this celebration. This is a five to ten-minute walk from the Civic Center, or there is closer parking available in the Randall Student Center parking lot. Information and Library Sciences Reception: Friday, May 10, 5:00-7:00 p.m.
Once graduated, you become an alumnus of UMA. As an alumnus, you are eligible for many alumni benefits and discounts. Please complete the UMA Alumni Contact Form, so we can stay in contact with you after graduation. You can also join the Alumni Association or opt in to receive monthly e-newsletters Moose News. Membership in the UMA Alumni Association is free, so join and see what we have to offer! If you’re interested in getting more involved in UMA alumni activities – and we hope you are – the UMA Alumni Association has regular monthly meetings that you are welcome to attend. Please be sure to notify the University of any changes in your mailing address and/or your e-mail address. You can initiate this by contacting the UMA Enrollment and Information Services at 621-3185 or 1-877-862-1234. You can also change your address, phone numbers, e-mail addresses online by using MaineStreet. The Family Educational Rights and Privacy Act (FERPA) is a federal law that protects the privacy of student education records. “If a student has requested that directory information not be released, no information will be released to any requestor, including insurance companies and prospective employers, without the expressed written consent of the student. Nor will the student’s name be included in the published Dean’s List, student directory, commencement brochure or any other institutional publication or press release.” If a student wishes to remove this restriction, s/he must submit written authorization to UMA Enrollment and Information Services (621-3185 or 1-877-862-1234). If coming from the south, take Interstate 95 north to exit 112. Continue off ramp (from ramp, you will be bearing right). At the first traffic light, turn right. If coming from the north, take Interstate 95 south to exit 112. At the end of the ramp, there is a light. Take a left into the right-hand lane to continue straight. At the third traffic light, turn right. The Augusta Civic Center will be directly in front of you. Facing the front of the Civic Center, the North Wing entrance is on the far right. Graduates should enter through there; guests should enter through the main entrance of the Civic Center (middle doors). Traffic will be heavy, so be sure to plan extra time for delays. Traditional (non-personalized) graduation announcements are available from the UMA Bookstore on the Augusta Campus, as well as through the Student Life Office on the Bangor Campus. You may also purchase personalized announcements directly from Balfour, a company that offers official graduation products. UMA class rings are available through Balfour, a company that offers official graduation products. Balfour offers many options and styles of high quality college jewelry. UMA Bookstore staff will be located just outside the Civic Center auditorium selling imprinted memorabilia and souvenirs to celebrate your achievements. Items available for purchase will include diploma frames, t-shirts, sweatshirts, hats, drinkware, and stuffed animals. The UMA Bookstore, located in the Richard J. Randall Student Center, will be open on Graduation Day from 8:00 a.m. to 2:00 p.m., where our full line of collegiate memorabilia will be available for purchase. The CAUSE Art Club and UMA’s Garden Club will be selling roses at Commencement at the tables located just inside the main doors of the Civic Center. An unedited recording (DVD) of the 2019 Commencement (after May 19) will be available through the UMA Bookstore for the cost of $20. Price includes standard shipping within continental US. Commencement is scheduled for Saturday, May 11, 2019, at the Augusta Civic Center. Guests should enter the Civic Center through the main, front doors. Commencement Exercises will begin promptly at 10:00 a.m.; the length of Commencement is generally 2 hours. Guests will not be seated once the processional begins (when graduates march into the auditorium); late arrivals must wait until the processional ends. Because of the size of the crowd, it is suggested that you make arrangements ahead-of-time to meet your graduate after the ceremony in a pre-arranged location. Please be aware that traffic delays can occur the closer you get to the Augusta Civic Center. Graduates and guests may want to leave earlier to arrive on time for line up and seating. The ceremony will begin promptly at 10:00 a.m. Guests should remain by their seats while the graduates enter. No one is permitted to stand in the aisles or to block the view of another audience member. Cell phones and pagers should be turned off. When this is not feasible due to urgent circumstances, the device should be set to vibrate or soft tone. It is requested that guests stay in their seats and not place themselves in the ceremony by drawing attention away from the graduates, calling directly to them, using noisemakers or signs, or approaching the graduates to take pictures. Guests should remain by their seats until the graduates, faculty, and staff have all marched out of the auditorium. There is no limit on the number of guests per graduate. Tickets are not required for admission. Guests will not be seated during the processional; late arrivals must wait until the processional ends before being seated. Elevators are available off of the main lobby to access the upper levels. In order to have the ceremony go as smoothly as possible for guests, designated seating areas for individuals with disabilities are available. Family members and guests needing more information about accommodations should contact Ariel Cassista, for more information at 621-3350/1-877-862-1234, ext. 3350, or e-mail ariel.cassista@maine.edu, no later than April 30. Please note we are not able to seat entire families in the special seating designated areas; normally only one member of your party can accompany the guest requiring special seating. In order to accommodate those who require this seating, additional guests must sit in the general seating areas. Wheelchair accessible seating and special seating for guests with mobility impairments, the elderly, and people with hearing and visual disabilities is available. A sign-language interpreter will be on the stage during the ceremony. Folks needing the services of the interpreter should indicate this to an usher. Disability seating will be on a “first-come, first-serve basis;” seating cannot be reserved. Please arrive early. We recommend that guests needing accommodations arrive by 9:30 a.m. to allow ample time to arrive, park at the Augusta Civic Center, and to find seating in the auditorium. Handicapped parking is located near the Civic Center. Also, family and friends who cannot walk a distance can be dropped off at the front of the Civic Center. Upon arrival to the Civic Center auditorium, guests needing special seating should approach an usher. Ushers wear UMA blue stoles and nametags and will assist guests to the appropriate, designated seating areas. Wheelchairs are available to use at the Civic Center; however, they should be used by guests to transport individuals to their seats and immediately returned to the main lobby for others to use. UMA is committed to ensuring that family and friends are able to hear the name of their graduate called and watch them receive their diploma as they cross the stage. Photos during the ceremony may only be taken from your seat or from the designated photography area located to the far right of the stage as indicated by the sign. Please do not block the view of other guests. Please be as quiet as possible as you move to take a photo, most especially if you are sitting in the metal bleachers. Arrangements have been made for professional photographers: LifeTouch Studios will be present to take photos of the graduates, as each crosses the stage and as each stands in front of the logo banner after leaving the stage. Proofs will be available about a week later and graduates should be contacted via email and given the web page address to view the proofs. Families are welcome to take photos in front of the podium following the ceremony. A special photography area has been set up in front of the Gazebo on the Commons, where the Commencement Reception will be held for all graduates and their families. There will be a reception with light refreshments immediately following the ceremony on the UMA Augusta Campus Green (between the Randall Student Center and Jewett Hall). Please join your graduate, faculty, staff, and other guests in this celebration. This is a five to ten-minute walk from the Civic Center or there is closer parking available in the Randall Student Center parking lot. The Augusta Civic Center has several parking lots that provide free parking. A limited amount of handicapped parking is available in front of the Civic Center and in the side parking areas. Family and friends who cannot walk a distance can be dropped off at the front of the Civic Center. Floor seating is available for those needing accommodations (please see Seating for Guests with Disabilities). Elevators are available off the main lobby to access the upper levels. Please visit the Kennebec Valley Chamber of Commerce for great information on local lodging options, as well as a listing of area restaurants, shopping facilities, attractions, and recreational activities. Graduating students needing disability accommodations in order to participate in commencement, should contact Ariel Cassista, for more information at 621-3350 or 1-877-862-1234, ext. 3350, or email ariel.cassista@maine.edu, no later than April 30. In order to have the ceremony go as smoothly as possible for guests, designated seating areas for individuals with disabilities are available. Family members and guests needing more information about accommodations should contact Ariel Cassista, for more information at 621-3350 or 1-877-862-1234, ext. 3350, or email ariel.cassista@maine.edu, no later than April 30. Faculty and staff are encouraged to attend graduation and to march in the commencement exercises. Exercises begin at 10:00 a.m. and will run until about 12:00 noon; reception to immediately follow. Faculty and staff should report to Civic Center by no later than 9:15 a.m. So that we plan appropriately for commencement seating, please RSVP to Ann Corbett by Friday, May 3rd. On May 11th, you should report to the Civic Center’s Androscoggin/Aroostook/Cumberland Rooms no later than 9:15 a.m. to robe. If you placed an order for a cap, gown, or hood, it will be available at the Bookstore by May 4th. Payment for a hood is required when you pick it up. The Bookstore will be open graduation day at 8:00 a.m. for those who are unable to pick up your regalia earlier. If you have not yet placed an order for a cap and gown, it may not be too late. Please contact Jerry Garthoff in the Bookstore at 621-3067 as soon as possible. There will be a reception on the campus Green immediately following the commencement exercises. If the weather is inclement, the reception will be held in the Randall Student Center. If you should need disability accommodations, please contact Ariel Cassista, for more information at 621-3350/1-877-862-1234, ext. 3350, or e-mail ariel.cassista@maine.edu, no later than April 30. Because your presence is so important to our students and their families and friends, we hope you will make every effort to attend this year’s exercises, as well as the reception afterwards. Graduates do look forward to seeing you and introducing you to their family and friends. Thank you for your commitment to this joyous celebration of the University’s graduates. Please click on the event date to see event details in the UMA Calendar. UMA East Millinocket Center Graduation Celebration: Thursday, May 2nd, 4:00 pm. UMA Brunswick Center Graduation Celebration: Friday, May 3rd, 4:00 pm. UMA Saco Center Recognition Ceremony: Friday, May 3rd, 6:00 pm. Service and Academic Awards Ceremony: Saturday, May 4th, 2:00 pm. UMA Rockland Center Graduation Celebration: Saturday, May 4th, 4:30 pm. UMA Athletics Hall of Fame Induction Ceremony: Wednesday, May 8th, 6:00 pm. UMA Bangor Graduation Celebration: Thursday, May 9th, 5:00 pm. UMA Ellsworth Center Graduation Celebration: Thursday May 9th, 5:30 pm. UMA’s Commencement Ceremony: Saturday, May 11th, 10:00 am. UMA Houlton center Graduation Celebration: Friday, May 17th, 5:00 pm.